Welcome to Degeneration Nation 2019. The frightening truth is that genetically engineered foods and crops, toxic chemicals and factory farms — the unholy trinity of industrial food and farming — are undermining our very survival. Public health and the health of the living Earth — our soils, forests, wetlands, watersheds, oceans and climate — are rapidly being destroyed, collateral damage arising from the "profit at any cost" ethos of corporate agribusiness, Big Biotech, Big Pharma and Big Food. After several decades of pressure from consumer activists, and a seemingly unending stream of food safety scandals, Big Food Inc. has continued to lose credibility and market share. Backed by corrupt politicians and powerful trade organizations such as the Grocery Manufacturers Association, the majority of large food corporations alienated millions of consumers by fighting against mandatory "country of origin" and GMO labeling of foods. At the same time, giant supermarket chains in North America and across the world, including Walmart, Kroger, Safeway and Amazon/Whole Foods, have been forced by consumer demand to increase the sales and marketing of their store-brand private-label organic and "natural" products as well. Even fast food chains such as McDonald's, Burger King and Subway, pressured by sagging sales among millennials and competition from natural/non-GMO food upstarts like Chipotle and Panera, have expanded their menus and put more emphasis on nutrition. Having failed to shore up their sagging profits with organic acquisitions alone, the food giants have hired an army of PR firms and political lobbyists to help them fraudulently "greenwash" and market billions of dollars of their conventional (GMO-tainted, chemical and factory-farmed) products as "natural," "all natural" or "ecofriendly." America's growing health awareness is a major driver of the growth in the organic, grass fed, natural health and green products sectors. But compounding the industrial and agritoxic pollution of our food, water and environment we have now, over the past several decades, we have been dragged into the Brave New World of Genetic Engineering and Frankenfoods as well. The impact on the environment of GMOs, chemical-intensive industrial agriculture and factory farms is equally devastating. They are responsible for water pollution, aquatic dead zones, aquifer depletion, degradation of the soil's ability to absorb and hold water, air pollution, destruction of grasslands and wetlands, loss of biodiversity, killing off wildlife, insects and pollinators, and causing soil erosion and massive climate-disrupting emissions of CO2, methane and nitrous oxide. Study after study links the nation's deteriorating health, including the chronic health epidemic of our children, to the increasing amounts of toxic chemicals and GMOs (essentially pesticide delivery systems) dumped into our environment and laced into our food. Chronic diseases now account for more than 40 percent of the $3.5 trillion that people are handing over to Big Pharma and the medical industrial complex. Scientific studies indicate that the overwhelming majority of these chronic diseases are caused by environmental and dietary toxins, rather than hereditary factors. "Regulatory authorities are ignoring a large body of peer-reviewed science showing the harm caused by pesticides and they are making decisions on data-free assumptions … A study by the U.S. Centers for Disease Control found a cocktail of many toxic chemicals in the blood and urine of most Americans." Before carbon-sequestering forests, mixed traditional cropping and grasslands were ravaged by chemical-intensive and now GMO and factory-farmed industrial agriculture (and industrial forestry), global soil organic matter generally comprised 6 to 10 percent of the soil volume — three to six times the 1 to 3 percent levels typical of today's industrial agriculture soils. In other words, taxpayer-subsidized, chemical-based industrial agriculture, factory farms and unrestricted grazing (along with industrial forestry) have turned the earth's soil (which still contains three times as much carbon as the entire amount of CO2 in the atmosphere) from being a major climate-stabilizing carbon sink into a massive and dangerous source of greenhouse gas emissions and global warming. "The Earth is the fundamental pillar of civilization … The erosion of soil, desertification and the shortage of water contribute to the stress and rupture of society. In this sense, the degradation of the soil can be considered as a 'threat amplifier,' especially because it gradually reduces the capacity of people to utilize the land for the production of food, the procurement of water and other vital ecosystem services." The destruction of soil carbon (and soil fertility), via degenerative farming, grazing and improper land use, is disturbing given that the top 3 feet of the world's soil holds three times as much carbon as the entire atmosphere.15 This makes the soil a major repository for carbon (along with forests and oceans) and therefore a major factor in maintaining climate stability. Today's nonorganic foods have lost 25 to 75 percent of the essential nutrients and trace minerals compared with 50 years ago. Massive soil degradation has taken place in every nation, not just the U.S. In a recent news report,18 scientists point out that that the U.K. appears to be 30 to 40 years away from the "eradication of soil fertility." 1. Stay informed and spread the message of organic, biodynamic and regenerative food, farming and natural health among your family, friends and neighbors. 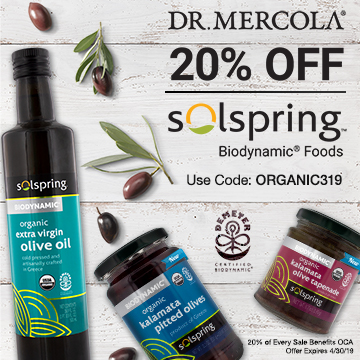 Some of the best newsletters, websites, social media and sources of information include Mercola.com, OrganicConsumers.org and RegenerationInternational.org. 2. Boycott GMOs, toxic pesticides and factory-farmed meat, dairy and poultry — today and every day. 3. Buy organic, biodynamic, 100 percent grass fed, pasture-raised and other regenerative foods and consumer products. 4. Get involved with other natural health activists and regenerators in changing public policy at the local, state and national levels. Become a grassroots citizen lobbyist with the Organic Consumers Association or OCA's grassroots lobbying arm, the Citizens Regeneration Lobby. 5. Make a tax-deductible donation to the Organic Consumers Association or Regeneration International to support our ongoing campaigns against Monsanto, GMOs and factory farms. We’re Tripling Your Donations for GMO Awareness Week! This week from March 17-24, Mercola.com highlights GMO Awareness Week by raising public awareness among people who previously didn’t realize genetically modified organisms are in their food. During this week, we will help you learn more about the dangers of GMOs and instruct you on how to eat healthier and purer food. GMO proponents claim that genetic engineering is “safe and beneficial,” and that it advances the agricultural industry. They also say that GMOs help ensure the global food supply and sustainability. GMOs pose one of the greatest threats to life on the planet. Genetic engineering is NOT the safe and beneficial technology that it is touted to be. Fortunately, we have organizations like the Organic Consumers Association (OCA) who are fighting diligently to have GMOs labeled. More than 80 percent of the support to the OCA comes from individual consumers like you – so you can help ignite real change with your donation!